BANGOR, Maine – The New England Patriots clinched a berth in the Super Bowl with their win over the Jacksonville Jaguars last Sunday. Husson students will get the chance to hear about the game from someone playing in it: Patriots Captain Matthew Slater. 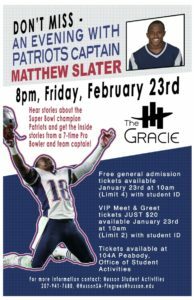 Husson Student Activities recently announced an evening with the seven-time Pro-Bowl Special Teamer. The Feb. 4th game will be Slater’s fourth Super Bowl. Tickets for the event were released Tuesday morning. “We live in Maine, how often does this type of thing happen?” said Husson student and Patriots fan Tyler Hewey. “Someone has some strings,” said Hewey. The tickets are exclusive to husson students but they can bring whoever they want with their tickets. “I’ve got some pretty excited friends,” said Langille. Husson Student Activities annually host trips for Red Sox and Celtics games. This is the first time a Boston-area athlete has come to Husson as a free student activity event said Pingree. Former Red Sox pitcher Pedro Martinez was at the Gracie on Jan. 16 in event hosted by sports radio station 92.9 The Ticket. The radio station has also brought Patriots wide receiver Danny Amendola, former Red Sox manager John Farrell, and former Red Sox center fielder Johnny Damon to Husson. All of those events came at a cost for students. 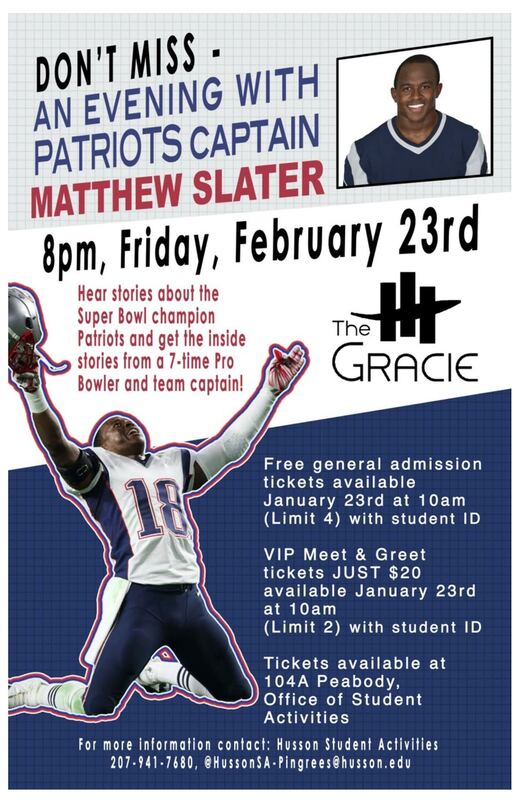 The Slater event will take place 19 days after the Patriots participate in Super Bowl LII. The event worked with Slater’s schedule with the season over and Slater hanging around New England said Pingree. The Patriots had to erase a 10 point deficit in the fourth quarter to reach their third Super Bowl in four years. “Watching the [AFC Championship] game I was thinking about what the Pats not winning the game would do for the event. When they won the game I got that much more excited,” said Pingree. General admission and VIP tickets are still available for Husson students in Peabody 104A. The tickets are expected to go fast because of the limited seating of the Gracie said Pingree. For more information you can contact Sterling Pingree at Pingrees@husson.edu.